Broadcast journalist Korina Sanchez (upper left frame) tookhome three individual awards and another one for her morning radio program togetherwith co-anchor Ted Failon (upper right frame) in the recently concluded 17th Golden DoveAwards held at the Taal Vista Hotel in Tagaytay City. Sharon Cuneta's eponymous show bagged the award for Best VarietyProgram. ABS-CBN Broadcasting Corporation dominated thisyear's Golden Dove Awards given out by the Kapisanan ng mga Broadkaster ngPilipinas (KBP). The awarding ceremony was held at the Taal Vista Hotel inTagaytay City last Monday, November 17. The Lopez-owned network amassed a total of 26trophies out of the 49 award categories, including the coveted Best TV StationAward, an honor they also earned last year. ABS-CBN's radio station DZMM bagged the award for Best AM Radio Station. Veteran broadcaster Korina Sanchez bagged threeawards: Best Magazine Host for Television, Ka Doroy Broadcaster of the Year,and Best Public Affairs Host for Radio. 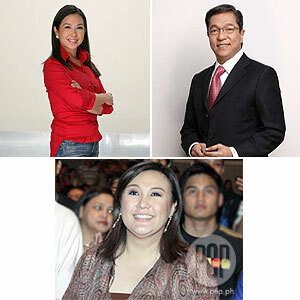 Korina's longtime co-anchor Ted Failon received the award as Best Television Newscaster for TV PatrolWorld. Ted and Korina's radio program Tambalang Failon at Sanchez, aired on DZMM, won the Best Public Affairs Program. ABS-CBN's coverage of the Manila Peninsula Siege,which took place on November 2007, was hailed as Best Newscast. Maalaala Mo Kaya'sepisode titled "Sako" starring Joshua Domingo took home the award forBest Drama Program. Sharon won the Best VarietyProgram for the episode "World Class" shown last May 18. This episode featured Filipino talents who are currently making wavesabroad like Charice Pempengco, the Philippine All-Stars, and Lea Salonga. Now on its 17th year, The Golden DoveAwards is an annual event organized by the KBP and is dubbed as "thecountry's answer to the international TV Emmy Awards." GMA-7 is not a member of the KBP, thusexplaining the absence of their shows in all the categories. BeatDrama Program: Maalaala Mo Kaya, "Sako" episode (ABS-CBN Broadcasting Corp.